WELLINGTON — Up to 145 pilot whales have died in a mass stranding on a remote part of a small New Zealand island, authorities said on Monday. The stranding was discovered by a hiker late Saturday on Stewart Island, 30 kilometres off the southern coast of the South Island. "Sadly, the likelihood of being able to successfully re-float the remaining whales was extremely low," said Ren Leppens, the Department of Conservation’s operations manager on Stewart Island. "The remote location, lack of nearby personnel and the whales’ deteriorating condition meant the most humane thing to do was to euthanise. "However, it’s always a heart-breaking decision to make." 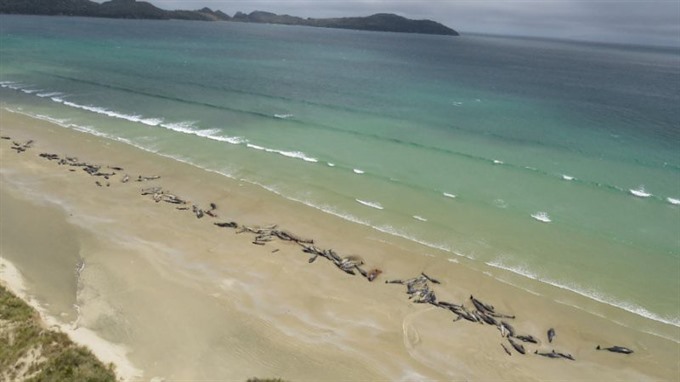 On Sunday, 10 pygmy killer whales stranded at 90 Mile Beach at the top of the North Island. Two have since died and attempts will be made on Tuesday to re-float the survivors.